When it comes to eye makeup removers, I usually stick to using the more affordable, drugstore kinds. As long as they do the job without stinging my eyes, that is all that really matters. Unfortunately, I haven't had too much luck in the drugstore eye makeup remover department. The biggest problem that I have with most is that they sting my eyes. That's a no-no for me. I think there are only one or two that I really like. Well, this past Christmas I received a lovely Lancome makeup kit from Jonathan's parents as a gift and, this cult-favorite was included-among other Lancome beauty items in which I will showcase in future posts. If you are interested, be on the lookout for them. 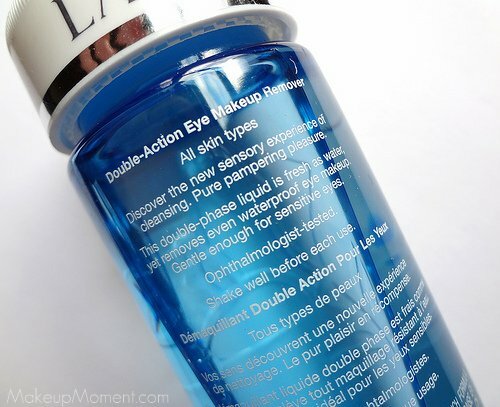 The Lancome Bi-Facil Double Action Eye Makeup Remover ($27.00) is a product that gets a lot of love from the beauty community, and I see why. This stuff really works! You shake the bottle to mix up the clear liquid content, and then pour some of the product onto a cotton ball or cotton round- I use a cotton ball. It's amazing to see how gently this remover dissolves and wipes away all of my eye makeup. Yes, waterproof eyeliner and mascara included! On days when my eye makeup is on the minimal side, one cotton ball per eye is sufficient to get everything off. And when I have on heavy layers of eyeshadow, eyeliner, and mascara, two cotton balls per eye usually does the trick. When they say that this eye makeup remover is gentle on the eyes, they mean it. When I use this eye makeup remover, I experience no stinging, irritation, nor the blurry vision that I sometimes get with other eye makeup removers. But I do end up with a bit of a slippery residue on the skin, though. To remove the residue, I take a clean tissue and gently wipe it off. After I have done that, the skin around my eye area feels so much smoother, hydrated, and supple. It's a really nice feeling. Overall, I really enjoy using this eye makeup remover and I think I am going to purchase a bottle, once I am done with this one. It removes my eye makeup with ease, it softens and hydrates the skin around my eyes, and most importantly, it doesn't irritate my eye area. I must admit though, the price tag puts me off just a bit. Because of the high price, I try and use this product sparingly to make it last a bit longer than usual. But, I think it's OK to indulge every once in awhile. Especially on a product that works like a charm. What do you all think? 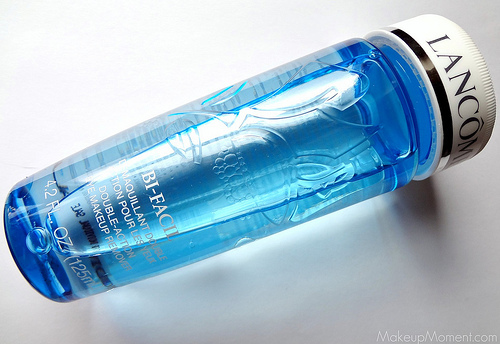 Have any of you tried the Lancome Bi-Facil Double Action Eye Makeup Remover? Which are your favorite eye makeup removers? Disclaimer: I am not affiliated with any of the companies mentioned above. I received this product as a gift. My opinions are always honest, never influenced and my own. Sounds like a great product! I love Lancome, and I've heard so much about this eye makeup remover!